While reading an Xbox forum awhile back I remember coming across a thread where a kid was trying to get someone to buy the video game 'Gears of War' for him because his Dad wouldn't let him get it. Nothing odd about that, Gears of War gave me a few nightmares when I was playing it. Nothing as bad as the sleepless nights when Tetris blocks fall endlessly after first playing that game. His dad's reason was that games like that were propaganda put out by the military to train kids to be soldiers. People pretty much flamed that idea. 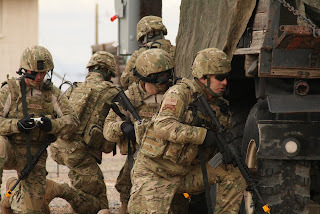 Check out what the soldier on the left is holding in this FCS exercise. That is an actual Xbox 360 wired controller (personally I roll wireless). Don't believe me? Look at this picture here. I assume he is looking through the camera of that unmanned vehicle with his eyepiece and controlling it with the....the controller. Pretty observant, huh? You can see where something like this could come in very handy on the battlefield, especially in urban environments. Why risk a life when you can send one of these in to see what is up. This is very much like another game I have been playing, Tom Clancy's GRAW. In that game you have a Cypher UAV that you can use to spot the enemy. Imagine how valuable technology like this would be for say, search and rescue. It would be relatively inexpensive compared to a helicopter and require a fraction of the pilot training. You wouldn't worry about flying it in inclement weather as much. So, in line with the $10,000 military toilet seats joke, I wonder how much a $30 Xbox controller costs? The non-profit Rescue on Everest Trust has set out to make Mt. Everest a relatively safer place, recently announcing the Rescue on Everest Challenge with the intention of putting an unmanned rescue helicopter on duty to pull stranded mountain climbers to safety.